Loud clanging, uneven temperatures, muggy home. Sound familiar? When you have a broken air conditioner in Fredericksburg, the signs are usually pretty obvious. At Robert B. Payne, Inc., our technicians have seen just about every malfunction you can imagine on nearly every make and model out there. That is just part of what makes us so qualified to perform your air conditioner repair. If you want to replace your broken air conditioner with a higher-efficiency model, our team can make recommendations and perform the installation. Finally, we want to make sure your HVAC is in good shape year-round, which is why we offer several maintenance programs. Between our high ratings, our proven standard of excellence, our maintenance expectations, and our extensive knowledge base, it is safe to say that choosing Robert B. Payne, Inc. is the smart decision for your central AC repair. When the central unit within your home or business breaks down, we’re the team that’s there to get you back up and running as quickly as possible. It shows customers our dedication when we arrive at a job ready to repair or replace a central air conditioner. We expect the worst, and so we come prepared every time. 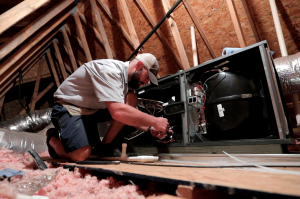 Sometimes, customers are not aware of the flexibility that HVAC companies can provide. As an example, customers are often surprised when we mention that we offer auto air conditioning repair. Yep, we can even fix your car’s AC. Instead of trying to get into a repair shop to fix the issue, just call Robert B. Payne, Inc. The technicians on our staff are skilled in all kinds of HVAC repair, and so auto air conditioning repair is no different. All that to plainly say: We are a resource you can use for all of your HVAC needs. Even when you least expect it, you can call our team for help or advice. If we can’t fix it, we’ll tell you who can. Emergency repairs around the home are never fun, and they always seem to need attention at the worst possible time. At Robert B Payne, Inc., we know your family is busy, and so we work around your schedule. Plus, our experienced professionals show up on time, prepared to handle your air conditioner emergency. So if your unit is blowing out warm air, has a strange smell, is making weird noises, or is causing you other problems, give us a call today. When you contact us for an estimate or service, one of our technicians will come to your home or business to assess the situation. Once you approve our estimate, we will get to work using only the best products to provide expert-level air conditioner repair services. Type of fuel. Natural gas-powered or propane models tend to be slightly more expensive to repair than electric AC units, no matter the source of the problem. Age of your AC unit. If your AC is an older model, it will likely be much more expensive to repair. You might even consider replacing it altogether instead. Type of unit. Finally, of course, your AC repair costs depend on what type of system you have. If you have questions about our AC repair services, contact Robert B. Payne, Inc. today. More Questions? Read the FAQs or Contact Us! As for regular maintenance, for both those things you can do yourself plus the tasks a technician must do, there are some consistent things that must be accomplished, no matter what. First, you need to regularly check the plugs and ducts that come to and from your air conditioner. Ensure these are tightly in place. Additionally, changing your filters monthly is key to breathing healthy and fresh air – this is one home maintenance task you should not prolong. The fact of the matter is, when it comes to your air conditioner, your filter acts as a barrier. The filter collects dust and debris that is brought in through the air. Filters prevent allergies and sickness from becoming an everyday occurrence in your home. You should have maintenance checks completed seasonally. This ensures that your system is geared up and ready to go for the next major weather change. If your AC unit is 10 years old or older, it’s probably time to look at replacing your air conditioner. You’re approaching a time when the money you’ll invest in keeping your older unit up and running will quickly exceed the money you could’ve invested in a newer, more energy-efficient unit. Not only that, but when used correctly, an energy-efficient unit can save you almost 20% on your utility bills. If you have questions about replacing your air conditioner, give us a call. We’ll be happy to help. Still have questions? That’s not a problem for us. No job is complete unless the customer is happy. At Robert B. Payne, Inc., our main priority is your satisfaction. To request an estimate or air conditioner repair service in Fredericksburg, please fill out our online contact form or call us at (540) 373-5876.